FBTBForums.net :: View topic - "Don't do it Anakin!" Posted: Wed Jan 28, 2009 11:46 pm Post subject: "Don't do it Anakin!" 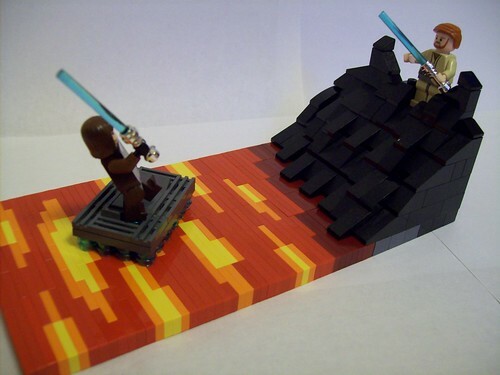 Anakin prepares to jump to his chopping on mustafar. Special thanks to Darth Pineapple for his techniques! This is awesome, like many others, I love the lava! And the mountain is nice, too. Once again your hill-construction skills amaze us all. The lava is very beautiful as well, although not very lava-like. Still, like I can do any better. Props! That's really cool, in a hot lava type way! Nice work. That's pretty cool dude. But, I gotta say this too raise the raft thingy off the lave with a clear brick or something. Indeed, raising the raft would make this pretty much just perfect. It looks good now, too, though. The hillside looks great and the lava is just cool. Great work, overall. ...SNOT lava is legit. Awesome vig. I second Juns. Boy, that is some nice work. Keep it frakking up, man! Ohboy I like the lave and design Nice!